At the end of 2002, BBC News Online published its Sound of 2003 list - 10 new music artists who came top of a survey of critics and opinion-formers to find the hottest new stars. Here, we revisit the list to see how the 10 acts fared over the last 12 months, ahead of the Sound of 2004 list being published next week. Check the site from Monday, when we will reveal one artist from the top five every day until the winner and full top 10 are announced on Friday. The last 12 months belonged to 50 Cent in the US after his album, Get Rich or Die Tryin', became the fastest-selling debut ever. It went on to become the biggest-selling album of 2003 in the US, while his hit single In Da Club achieved the same feat in the singles market. His past as a drug dealer and shooting victim gained him notoriety and he is now rivalling his mentor Eminem as the top rapper in the US. If you heard rock fans shouting "Danger! Danger!" 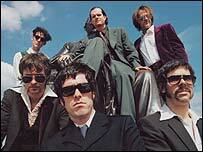 or "I want to take you to a gay bar" in 2003, it was this Detroit group's fault. Wild and silly but catchy and eminently danceable, their catchphrases and good-time attitude earned them two top five hit singles - although they were seen as a novelty band by some. One of the leading groups to come out of New York since The Strokes, this trio enjoyed critical acclaim and some commercial success in 2003. Three singles reached the UK top 40, peaking with Date with the Night at 16 in April. They were also nominated for the Shortlist Prize - the US equivalent of the Mercury Music Prize - and got a Grammy nomination for best alternative album. This Irish group found a large audience with their deliriously sunny Beach Boys-inspired tunes, although they did not break into rock's premier league. Their debut album, So Much for the City, was one of the soundtracks to the summer and was nominated for the Mercury Music Prize. Three singles reached the UK top 40, led by Big Sur, which hit number 17 in June. 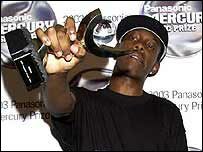 The UK urban breakthrough artist of 2003, Dizzee Rascal produced one of the freshest and most innovative sounds of the year. Armed with a distinctive quick-fire rapping style and harsh beats that mixed UK garage and hip-hop, his debut album, Boy in Da Corner, won the prestigious Mercury Music Prize, beating the likes of Radiohead, Coldplay and The Darkness. New York art rockers Interpol were the only artists in the top 10 not to have a UK top 40 single in 2003. But their stylishly brooding debut album Turn on the Bright Lights turned many heads and earned a nomination for the Shortlist Prize. With pumping bass, pounding beats and punky vocals, London "dirty house" duo lent some attitude to dance music. The year saw them break out of the club scene and into mainstream music, and their single We Don't Care reached number 15 in January. This teenage US singer failed to capture the hearts of the soul audience in 2003. The adolescent pop on his debut album was not enough to propel him to mainstream success in the US - but he did enjoy top 30 hits in the UK with Just A Friend and C'mon. New Zealand's premier guitar grinders The Datsuns made a splash at the start of the year, gaining a reputation as an explosive live band. They were named best live act at the NME Awards but they struggled to transform their on-stage energy into sales. Jamaica's latest idol was one of the year's smash hit stars, taking dancehall reggae to the top of the charts around the world. 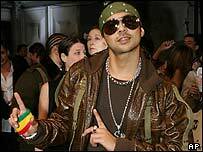 He scored five UK top five singles in nine months, including a number one guest spot on Blu Cantrell's Breathe. He also hooked up with Beyonce on Baby Boy while his solo track Get Busy was one of the biggest-selling singles of the year in the US. 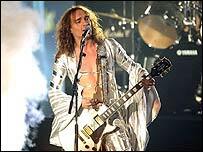 The spandex-clad rockers were the success story of the year in UK rock, bringing the fun back to a guitar scene that had been dominated by serious and stony-faced bands for a decade. They were known in the music industry before 2003 - but not one music expert tipped them in the Sound of 2003 survey because no-one thought they could make it. June saw this US goth rock band burst to the top of the charts after their song Bring Me To Life appeared on the soundtrack to the Ben Affleck film Daredevil. One of the year's biggest-selling singles came from this LA-based hip-hop group with Where Is the Love?, taken from their third album. This charismatic young pianist and singer became the most popular jazz artist the UK has seen for decades when his album Twentysomething was released. The Sound of 2003 list was compiled from the recommendations of almost 40 music critics, DJs and playlisters, who were each asked to give three tips for the top. 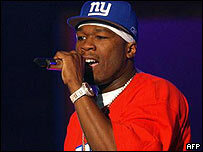 Artists who had UK top 20 singles before 1 January 2003, and those who found fame on TV talent shows, were not eligible.